Annnnd we’ve been hit with the humidity. Yuck! This is the uber gross part of living in the mid-atlantic. You walk outside and you’re hit immediately in the face with this muggy, wet air. No thank you. I’ll take dry heat any day! Memorial Day is next Monday and I’m sure there’s going to be a mass exodus from this area to head down south to the beaches of North Carolina and beyond. Anyone traveling for Memorial Day? Going anywhere fun?? Holidays around here make me happy because since 65% of the people who are here aren’t actually from here originally so they leave and go home to their families. Which only means less traffic for me to and from work. :) I know, I’m so selfish but literally last week I thought I was going to be late to cycling class. I usually leave 40 mins ahead of time but then I get there and am sitting in the parking garage for 30 minutes. Last week, I got there with 7 minutes to spare. Do you know how nerve-wracking that is for someone who is super type-A?! I was cursing up a storm! Haha..traffic around here blows and is so very unpredictable! 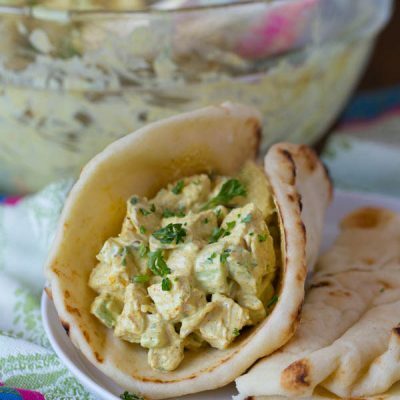 So since Memorial Day is coming up, I figured this cold curry chicken salad recipe would be the best thing to have on a potentially hot and muggy day. I love cold salads for get togethers in the summertime. 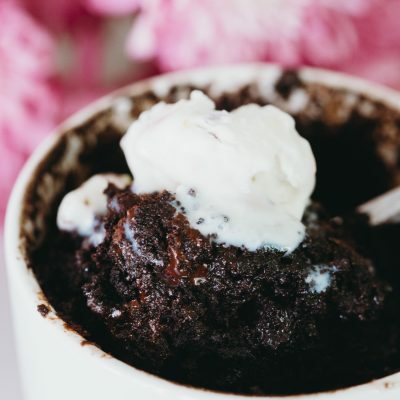 Nothing is as refreshing when you take a bite into something cold when you’ve been baking out in the sun, or just standing there and letting the humidity make you sweat profusely. I’m a huge fan of chicken salad but I’m a bigger fan of amping up the flavors so I decided a curry chicken salad would do my taste buds some good. I’m not a fan of adding grapes or fruit in my chicken salads (nothing wrong if you do! ), but I just like mine to be all savory. 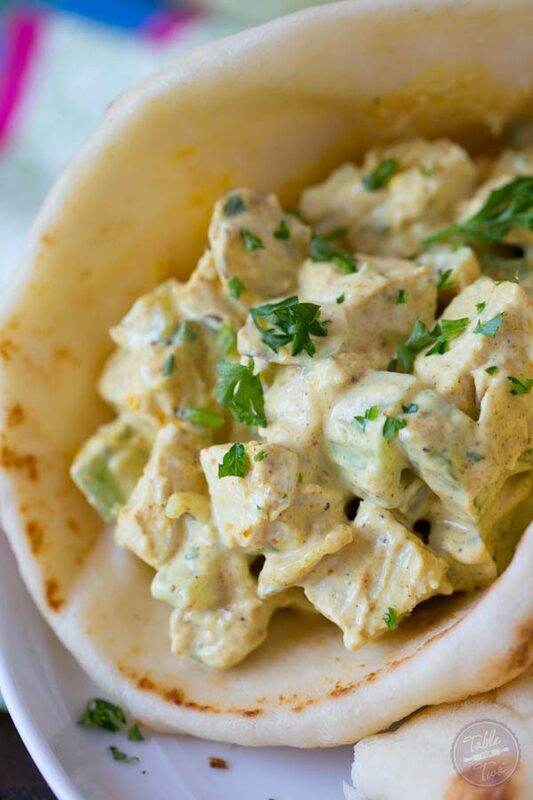 Wrap this curry chicken salad up in some naan, dip your feet in the pool, and call it a great day! 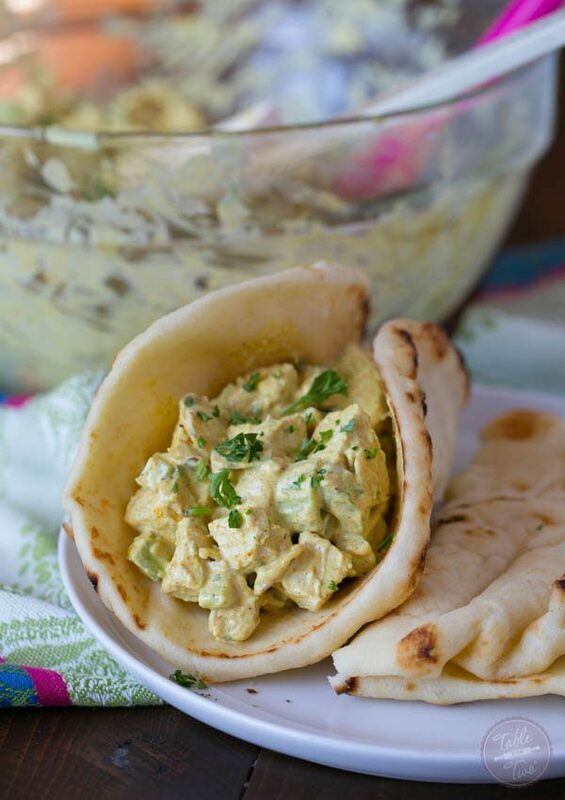 Curry chicken salad is the perfect side item to have at any gathering! In a large bowl, combine all the ingredients and evenly toss together until everything is coated. Cover bowl with plastic wrap and put in the fridge for at least 4 hours before serving. You can do this day the before, as well. Sprinkle parsley on top for extra garnish, if desired. I just boiled water and put the two chicken breasts in and boiled until the chicken was cooked through. 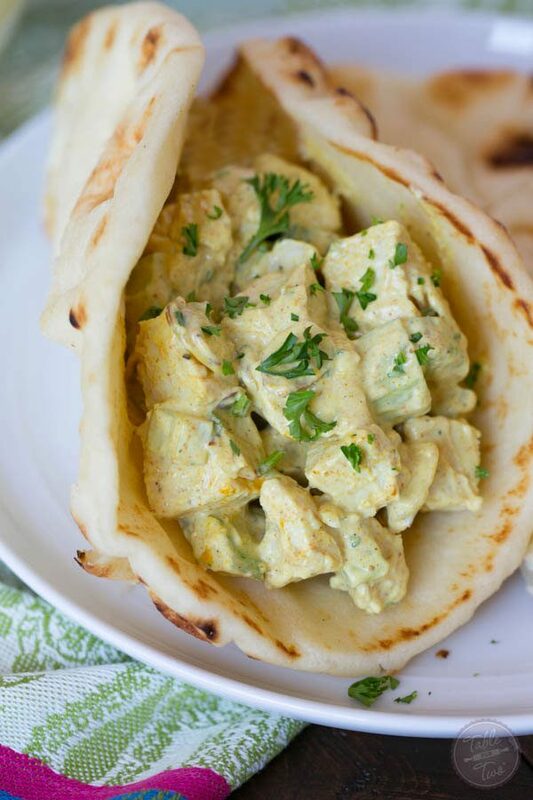 Curry is so good in chicken salads like this! This looks so good Julie! Love these flavors! I adore curry! 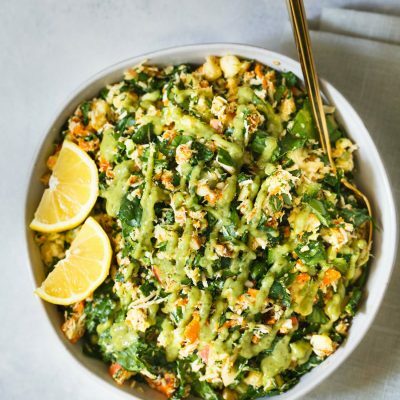 Definitely need to make this salad ASAP! Oh I totally know what you mean about traffic. The days I hit it on the way to yoga I can’t stop bad mouthing the drivers around me. And then I’m supposed to transition right into Namaste. LOL!! Omg, you crack me up. 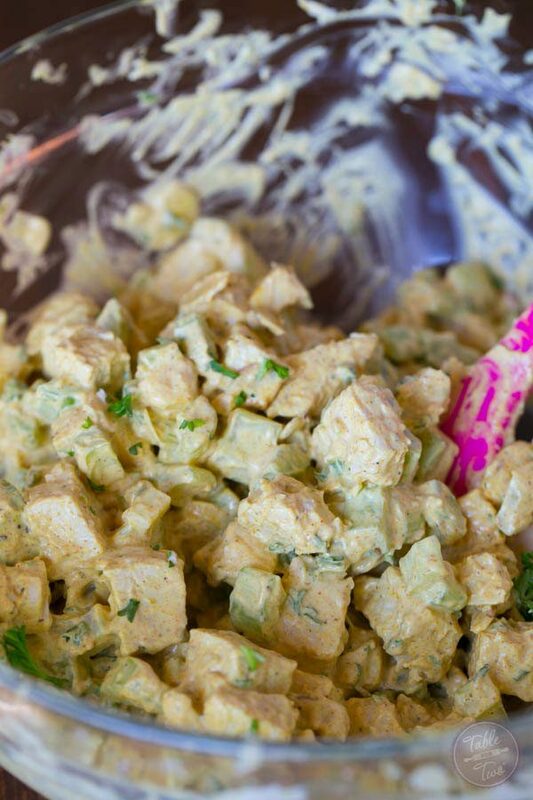 Curry chicken salad is one of my favorites…your recipe looks fantastic! I love the curry in this! Also love the Paleo countdown at the bottom of the page!!! I cannot wait to hear about that! Great idea to spice it up with curry! This looks delicious. When cooking chicken in water, we add vegetables to the water and end us with a tasty stock, too. Rachel, PLEASE REREAD RECIPE. There is yogurt and mayo in the recipe not yogurt instead of mayo. Why boil all the good out of the chicken? Why not oven roast or bake? You can feel free to roast or bake if you have the time. I boiled the chicken and then jarred the chicken broth that was made from boiling the chicken so I could have homemade chicken broth for other recipes. Awesome recipe. I enjoyed it very much. I used some chicken breast that I had brined and smoked a while back for future use. I love curry. And the smoke flavor went very well with it.